Ms. Bean-Raymond is the author of the globally released book titled, “The Illustrated Guide to Holistic Care for Horses.” Equine massage, equine acupressure, equine exercise, equine stretching and equine herbal remedies are among the topics that are included in this book. Chock full of photos, illustrations, charts and many techniques, this practical book is meant to be brought into the barn and used by those wishing to apply these therapies to their own horses. This book has received EXCELLENT reviews from The Equine Journal, The Horsemen's Yankee Pedlar, The On-Line Radio Show Animal Talk Naturally, Equine Wellness Magazine and SOLD OUT at Equine Affaire. In a true honor, “The International Association of Animal Massage & Bodywork's” President, Jonathan Rudinger gave this book an outstanding review as well. In a noteworthy benchmark to the success of this publication, it has been adapted into the curriculum as part of the Holistic Animal Nutrition Certification Program at the Global College of Natural Medicine. If you would like to order your own copy of this magnificent book for $24.99, simply click “Buy Now” button below. If you would like to meet the author in person, and have a copy signed, visit the Events page to see the current book signing/clinic schedule. Also, follow us on Facebook!! Shipping in USA is $5.95. Massachusetts residents are charged 6.25% Mass Tax. International Buyers - Please contact us for shipping rates so we can provide you with the most economical rate for your country. 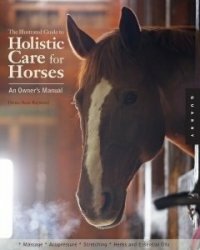 Reviews from customers on BarnesandNoble.com and Amazon gave "The Illustrated Guide to Holistic Care for Horses" 5 out of 5 stars in their reviews. This review is from: The Illustrated Guide to Holistic Care for Horses: An Owner's Manual (Spiral-bound) This book is very user friendly and easy to read and understand for novice readers and professionals alike. I feel this book is a great read for anyone wanting to help their horses live a pain free life. This review is from: The Illustrated Guide to Holistic Care for Horses: An Owner's Manual (Spiral-bound) I am new to the equestrian community and learning what is the best possible care for these animals that truly become part of the family. As I have learned of alternative practices to care for our own bodies, this book sheds light on healthy alternatives for our four legged friends. If you believe your horse can be healthy and cared for without all of the drugs and chemicals, you should own this book! This is a terrific book. The author speaks to the "total horse" and gives clear, informative holistic approaches, exercises, and techniques to keep your horse happy and healthy. The book is full of helpful illustrations, charts and photos. There's also a great reference section. I've had the pleasure to see Denise Bean-Raymond present a number of clinics. She knows her business and clearly cares deeply about horses. She's the real deal. There are always people lined up after her presentations to ask more questions and purchase her book. I've bought this book as a gift for several horse-owning friends. They have all found it very helpful. But don't take my word for it. Go to the author's website and see the equine publications and organizations who have heartily endorsed this book. I find this book very well rounded, covering a wide verity of holistic care from general horse management and nutrition to stretching and exercise to massage, acupressure, herbs and essential oils. Each subject the book touches on could easily be overwhelming, but the author breaks the information down into manageable portions while still delivering lots of detail. The book also has a bunch of quick reference charts and because of its hardy design I can bring the book out to the barn to reference. This is a very helpful manual for horse owners! I loved it. Posted May 15, 2011 Highly Recommended for all horse owners and lovers! I recently attended a clinic by Denis Bean-Raymond and purchased this book. I highly recommend it for all horse owners and lovers a like! Equine Wellness, the national resource magazine, has reviewed Denise's book in their May 2009 issue. Here is what they had to say: “Taking a holistic approach to horse care has a lot of benefits. It looks at the whole animal, not just the symptoms, and works to get to the root of problems rather than simply masking them. With nearly 30 years of experience with horses, as well as training in sports massage and equine acupressure, author and licensed riding instructor Denise Bean-Raymond presents The Illustrated Guide to Holistic Care for Horses - An Owner's Manual. The Horsemen's Yankee Pedlar also reviewed the book in their May 2009 issue. Here is what they had to say: “Denise Bean- Raymond, a veteran equine sports massage and acupressure therapist and a licensed riding instructor, brings us an all-encompassing guide to integrating complementary and alternative methods of health care into our horse's lives. These 224 pages are packed with useful information about nutrition, exercise, massage and much more. And the price tag, at just shy of $25, should make any savvy shopper salivate. The president of the International Association of Animal Massage and Bodywork, Jonathan Rudinger, reviewed the book in the July 2009 Newsletter. Here is what he had to say: It is an honor and a joy to be able to say a few kind words about the newly published book by IAAMB member, Denise Bean-Raymond, The Illustrated Guide to Holistic Care for Horses, An Owners Manual. Denise offers her extensive expertise and experience about everything horse and wellness, creating a real treasure for our community. I recall in the 1970's -1990's, there were few credible sources for information about the care and treatment of horses. There were only a few books in the library about horses, old ones about the Spanish Riding School and a hard to find one by Jack Meagher. The Equine Journal reviewed Denise's book in their April 2010 issue. Here is what they had to say: "The Illustrated Guide to Holistic Care for Horses" explores the physical, mental and emotional health, well being and maintenance of horses from a complimentary and alternative perspective. This comprehensive resource guide will help those intrigued by, but unfamiliar with, nontraditional methods of maintaining equine health, preventing and treating equine illness, and alleviating pain. Using the techniques featured in this book, in conjunction with veterinary care, can promote continued wellness in a healthy horse, give comfort to an elderly horse, speed healing in a horse recuperating from illness or injury, and help a horse with a chronic or acute condition.